It’s a cold, dark November evening, you’ve come home after a long day at work, and your hunger is quickly turning you hangry. 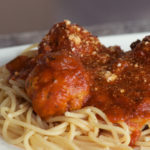 With some simple advance meal prep techniques, you could be coming home to spaghetti noodles, deep red tomato sauce and juicy, homemade meatballs less than 30 minutes from the time you walked in the door. 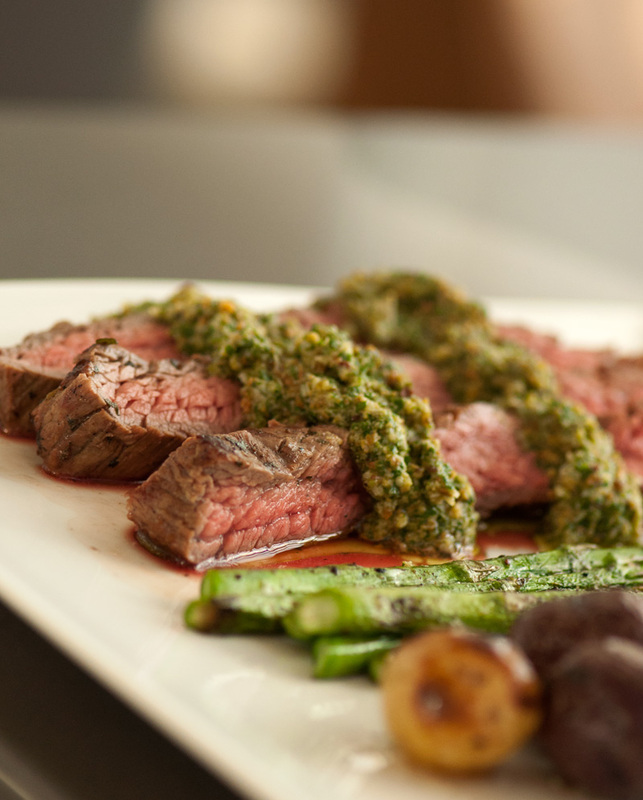 Read on to find out how and get the full recipe. 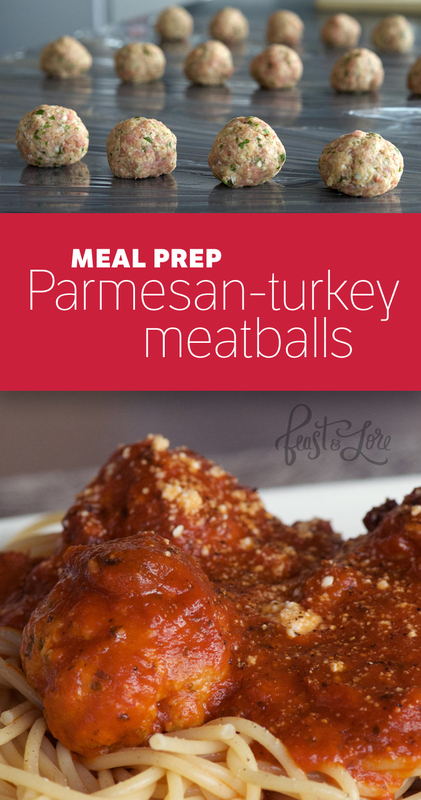 Meatballs offer a great intro to the world of advance meal prep. Spend about an hour in the kitchen one weekend afternoon, and you can make enough meatballs to keep your freezer stocked for six weeks or more. Making your own meatballs means you know exactly what went into them—allowing you to avoid unwanted sugar, salt, and fat that are most often found in store-bought varieties. These meatballs also provide an easy way add turkey into your regular meal rotation as an alternate to beef, chicken and pork. 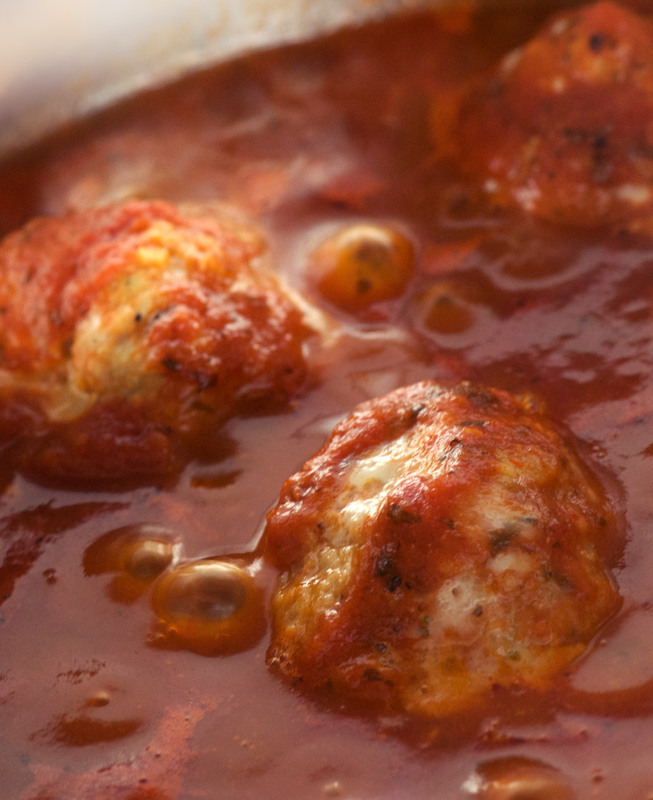 This meatball recipe originated from Martha Stewart, here. In the Martha recipe, spaghetti squash replaces the pasta which can be a nice healthy option to add more vegetables, but roasting the squash does require closer to an hour. I also find it’s hard to avoid a liquid watery-ness on the plate with the squash noodles, so for my version, I’ve stuck with regular spaghetti pasta instead. 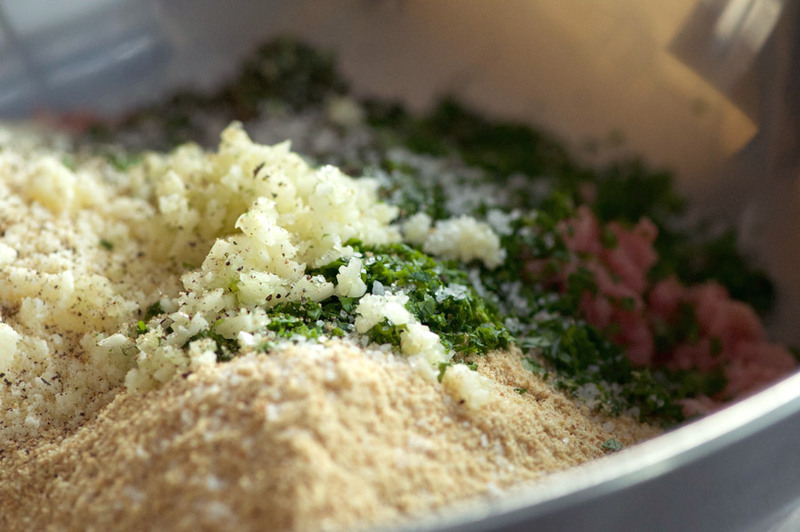 Breadcrumbs, garlic, parsley and Parmesan cheese are blended with the ground turkey to build texture and enhance the flavour. Egg and milk help the mixture hold together. While the Martha recipe advises to mix the liquid ingredients into the breadcrumb mix before adding to the turkey, I find it important to mix all the dry ingredients into the turkey before adding the eggs and milk, otherwise it can make the breadcrumbs soggy and the whole texture of the cooked meatballs goes from meaty and firm to mushy and blah. I like to season the mix with coarse salt and A LOT of freshly ground pepper, too. Once you’ve combined everything together into a consistent mixture, you’re ready to go into meal-prep assembly line mode! 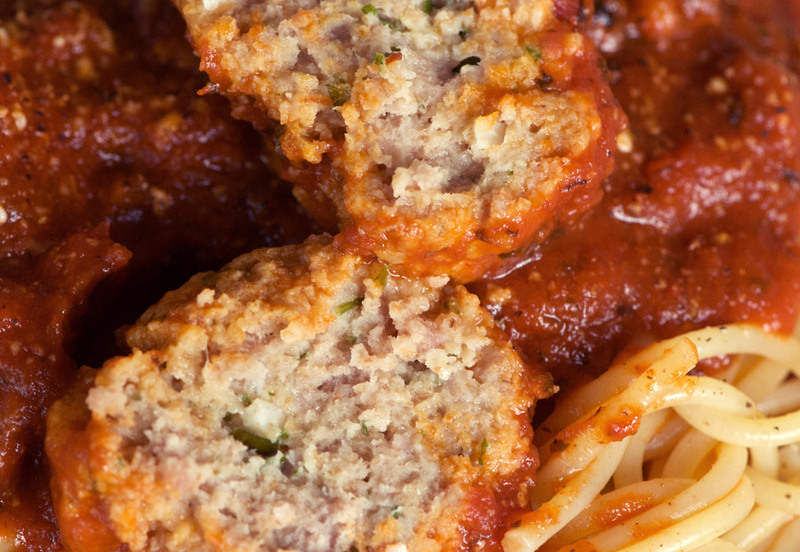 Figure out how many meatballs you want to cook up at a time. I go with seven meatballs per pack—which for us works out to enough for two dinners and leftovers for one lunch. Depending on the size of your family and how much you want for leftovers the next day, select the right number for you (or if you need a lot more than will fit onto a piece of plastic wrap, plan to grab two packs per meal and space them out accordingly). Next, spread out sheets of plastic wrap directly onto your counter. I usually put out 7–8 sheets, with each sheet approximately 16 – 18″ long. 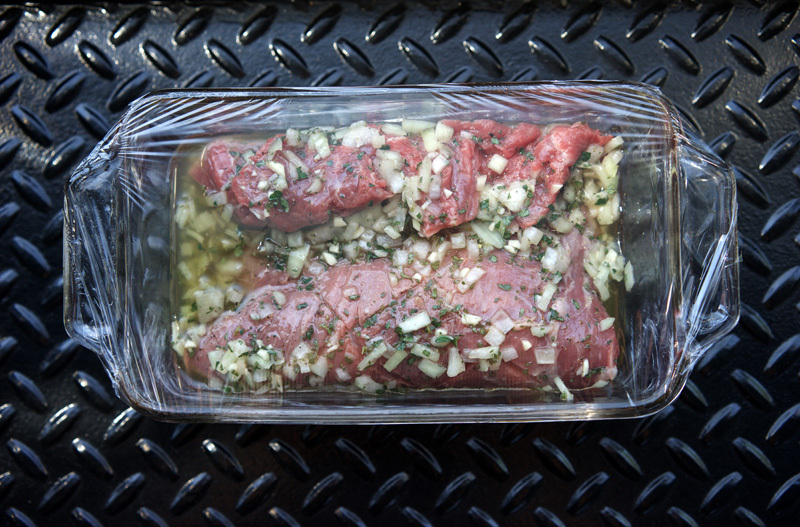 Now, start shaping your meatballs. Each one should be a ball about 1.5″ in width. 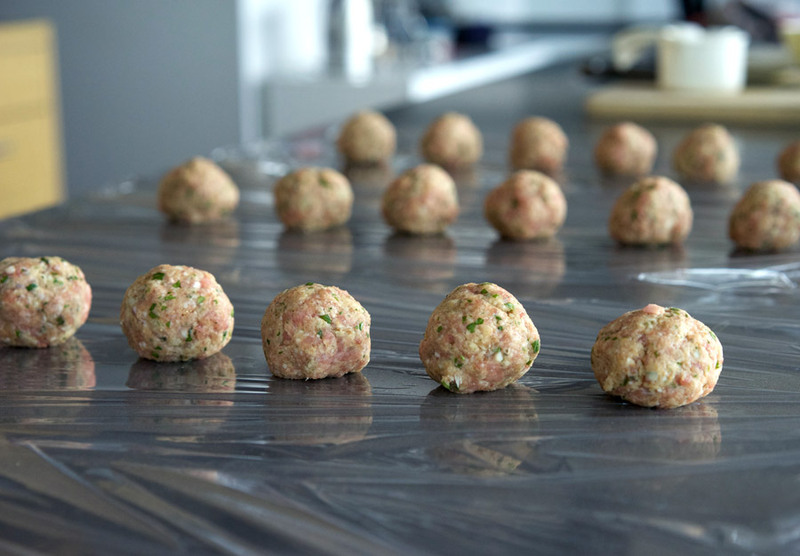 Place each meatball directly onto a prepared sheet of plastic wrap, in a line, with a space of about 3/4″ between each ball. 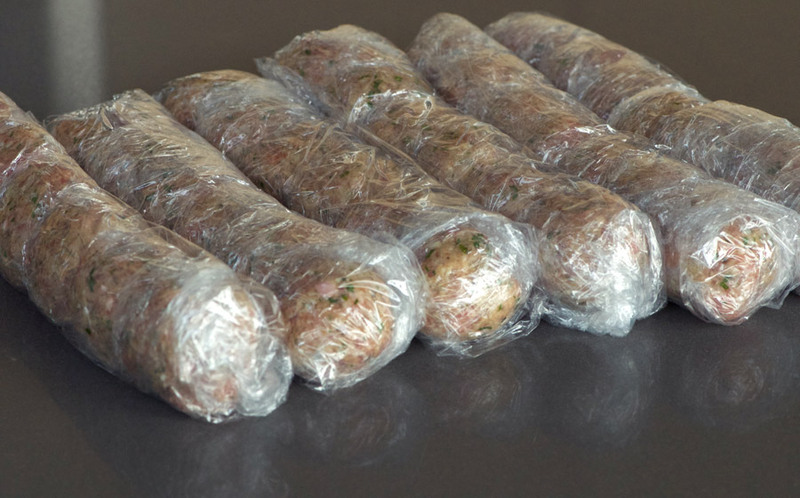 Once you’ve shaped all your meatballs, it’s time to wrap them up. 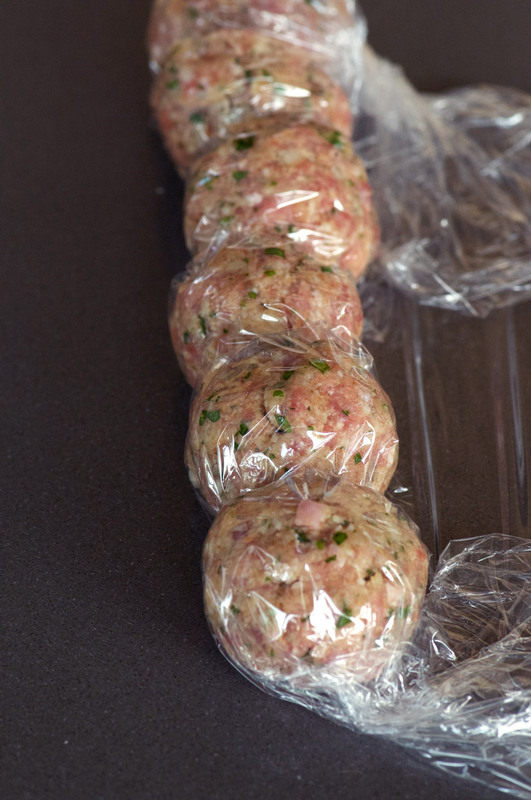 Grab the long end of the plastic wrap and fold it over the meatballs, pressing down to stick it onto the other side the sheet so that the meatballs are covered. Starting at one end, gently hold a meatball with the plastic around it and push it towards the nearest meatball, allowing the excess plastic to bunch up between them so the actual meatballs don’t touch and are separated by plastic. 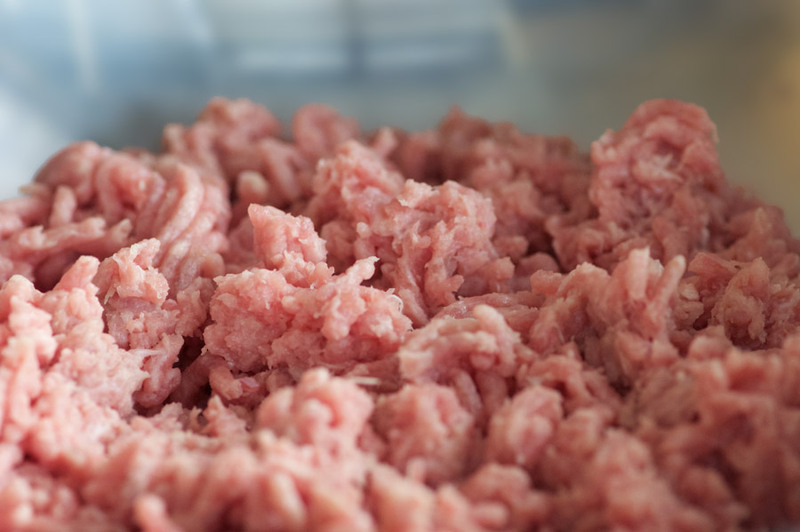 Continue bunching and pressing the meatballs together until they are bunched closely together and form a log. Grab a second piece of plastic wrap and use it to wrap the bundle together, folding the ends in first and then rolling for a firm, secure plastic wrap sleeve. To cook up a batch, grab a jar of your favourite spaghetti sauce and heat it to a gentle simmer. Grab a sleeve of meatballs from the freezer and throw into the microwave to defrost on very low power for about 30 seconds, just enough so that you can pull them apart. Unwrap them and drop the frozen meatballs straight into the bubbling sauce. 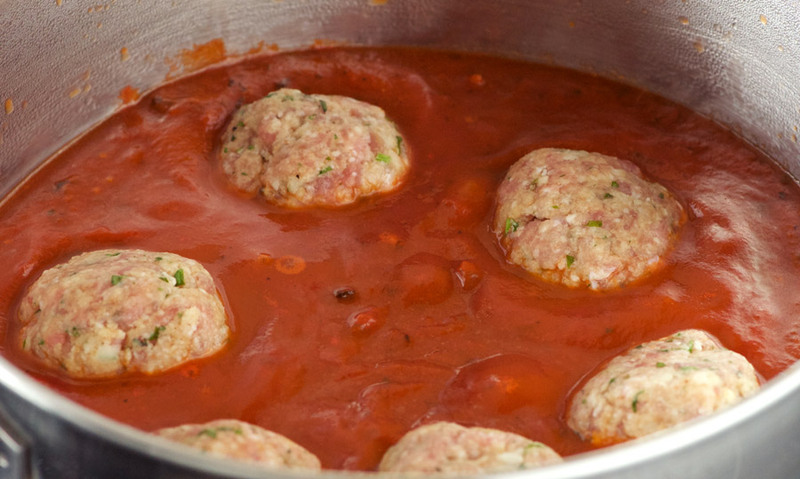 Cover and simmer on medium-low for 25 – 30 minutes, until the meatballs are cooked through. (Stir the meatballs a few times while cooking and watch that the sauce bubbles don’t get too explosive, as tomato sauce likes to blow the lid!) Most recipes tell you to brown the meatballs before cooking in the sauce, but I honestly prefer the way they cook without that step. I find the meatballs are more tender and I love how the Parmesan starts to ooze into the tomato sauce as they simmer. While the meatballs are cooking, boil up a large pot of salted water for the spaghetti noodles. At the 20 minute mark from when you dropped the meatballs into the sauce, add pasta to your boiling water and cook for 10 minutes or until al dente. 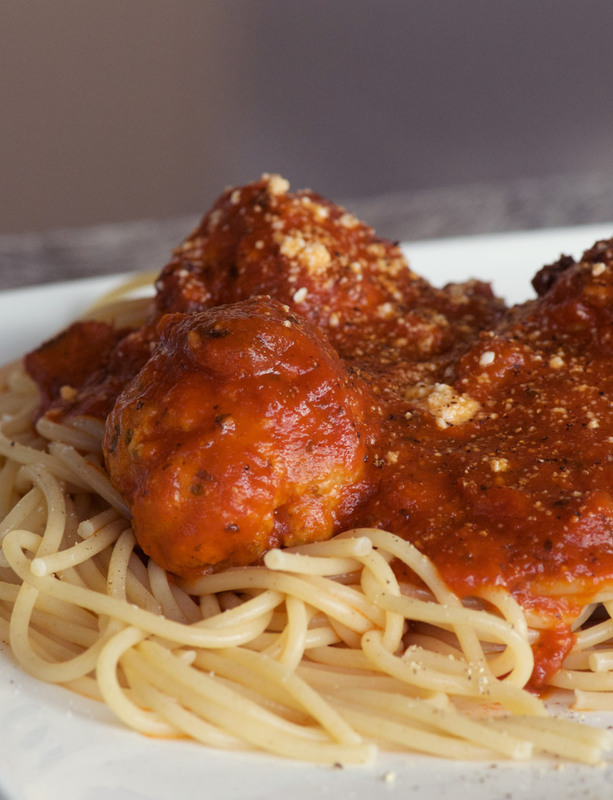 Drain the noodles, plate, and top with meatballs and sauce. Top with a little (or a lot!) 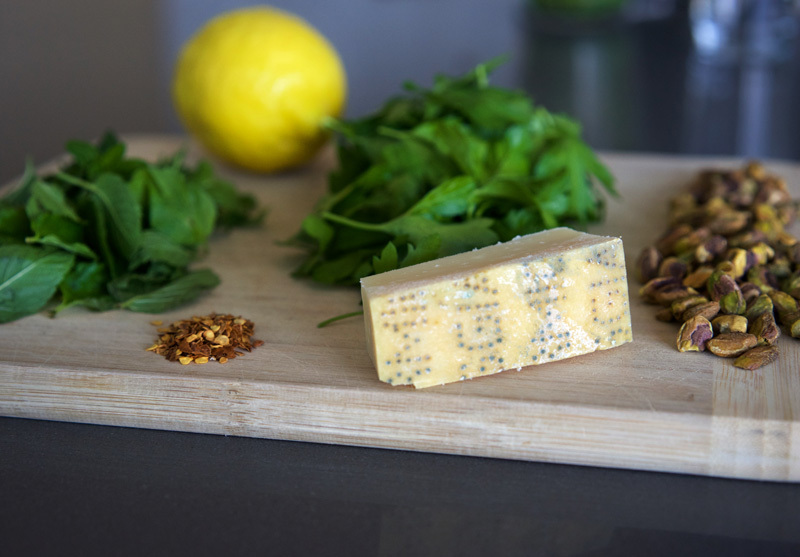 of additional grated Parmesan and a good dose of freshly ground pepper. 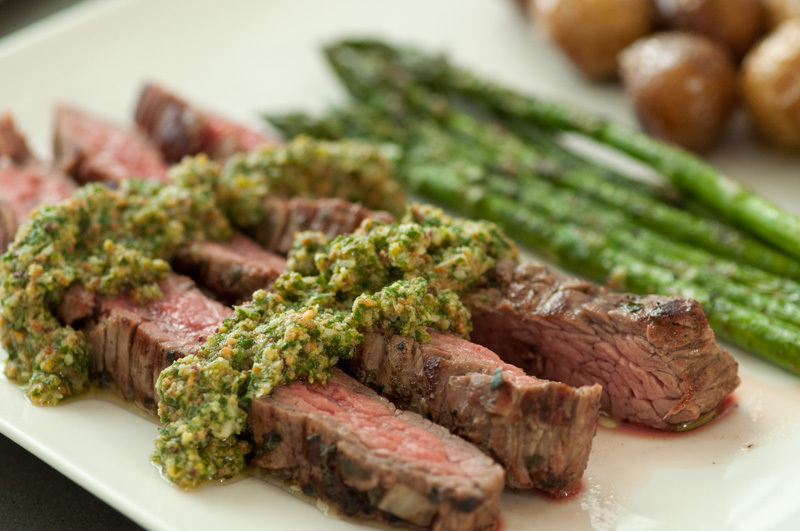 Homemade comfort, yours in 30 minutes—enjoy! Whip up a batch of these savoury, healthy meatballs on the weekend and enjoy comforting homemade dinners for weeks to come! Lay out plastic wrap sheets onto a table or counter, approximately 7 sheets, each about 18" long. In a large bowl, add the ground turkey. 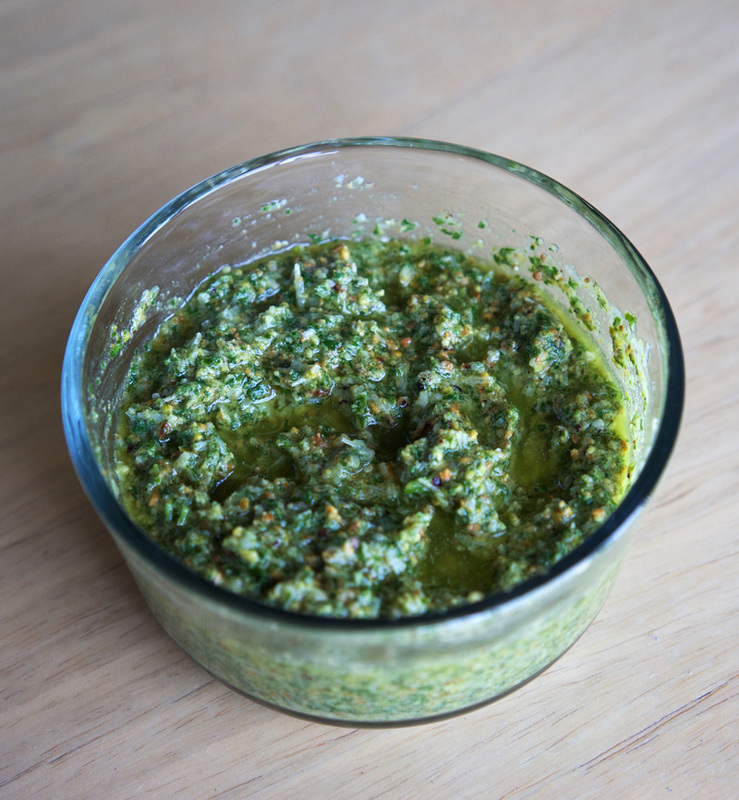 Add salt, pepper, breadcrumbs, Parmesan, parsley and garlic; combine with a fork until loosely combined. 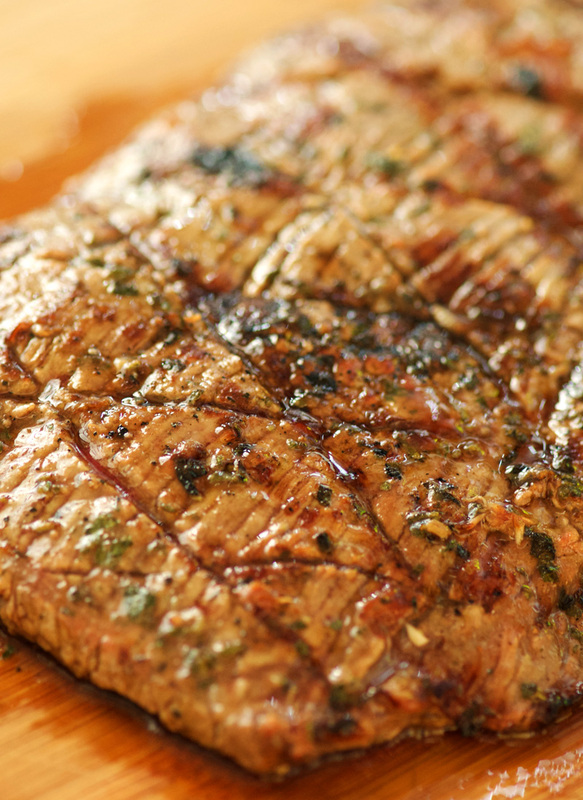 Add milk and eggs and lightly incorporate with a fork. 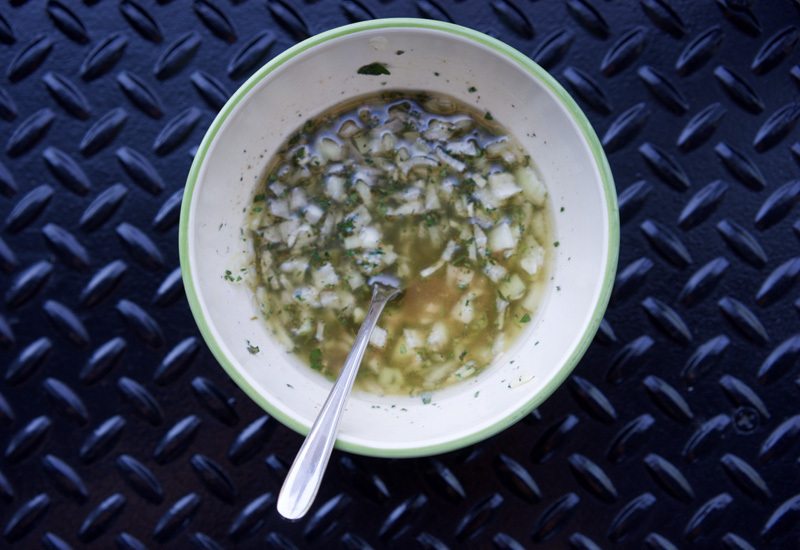 Using your hands, mix until it is fully combined and comes together into even consistency. Shape into 1.5" balls, placing onto the prepared plastic sheet. Decide how many meatballs you want to cook up at one time and place that number of meatballs onto each sheet, spacing about 3/4" apart. Gathering plastic between each meatball, scrunch them together so there is no more empty space between them, shaping into a log. Wrap another sheet of plastic around each packet to form a sleeve to be placed into the freezer. Continue until all the meatballs are completed, and place everything into the freezer. Meanwhile, boil a large pot of salted water over high heat. When the meatballs have 10 minutes left to cook, add the spaghetti noodles and cook 10 minutes, until al dente. Drain pasta, plate and top with meatballs and sauce. Top with additional freshly ground pepper and Parmesan if desired.